You don’t want out-of-season clothes to clutter your cupboards, sofas, and chairs. As a first step, pack all these unwanted clothes in boxes or suitcases and put them away. Find affordable organizers to place in drawers and cupboards to organize your jewelry, toiletries, undergarments, and other items neatly to clear away some storage space. Take unnecessary wall hangings down and store them. If you have kid at home, sort through their toy collection and keep only the ones they play with. 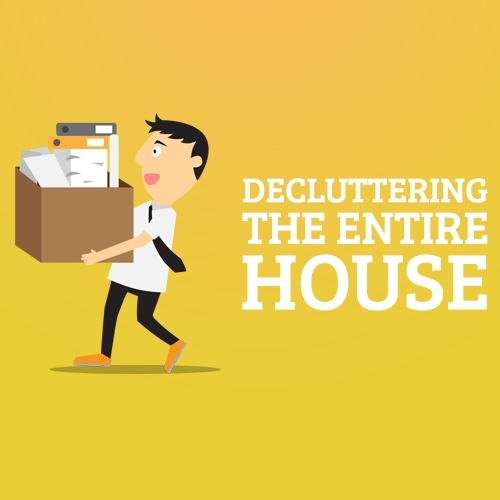 Pack the others in boxes and store them somewhere in the attic or under the bed. Remove all unnecessary items from the shelves and keep only those that are required on a daily basis, like toothbrushes and toothpaste. Sort through prescription medicines to keep only those that are important. Buy a hanging bag or organizer for toiletries to neatly arrange them. Get rid of old shampoo, body wash, and lotion bottles. Keep only the essentials and if you need other items neatly place them on shelves or racks.